Update: Added a diagram to match the stitched sample because, well, I don’t want you to think you’re losing your mind. That said, it’s clear I’m losing mine. Enjoy! December’s posts are from my collection of Christmas pillows. So brace yourself for a lot of red and green. Yes, yes, I know the holidays embrace far more colors than my pillows do, so please reimagine these stitches in your favorite holiday colors! I promise all of the colors will work! 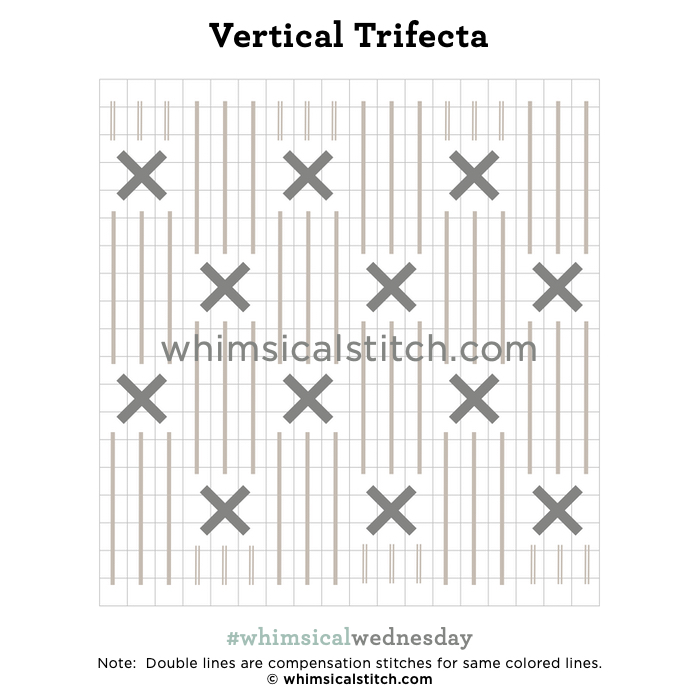 We kick off December with a #stitchingsunday featuring a long time favorite stitch, the Trifecta. The stitched sample is from a background on a Meri Meri Designs Christmas piece, using Snow and Rachelette, both from Caron Collection Threads. The diagram on the far right is another way you could fill the area between the blocks of white.